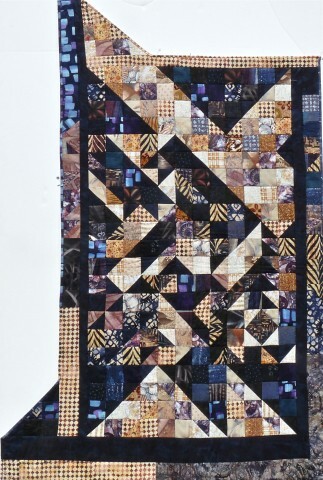 This quilt started out as a 16 patch with half squares on the diagonal to form large contrasting half squares. I managed to sew the first three squares along the top before all those little squares got the better of me. So I started playing around with breaking the pattern in ways that allowed it morph into other blocks. Look carefully, you’ll see bits of pine tree, stars diamonds and 4 patches here and there. It only seemed right that the blocks themselves broke out of the borders. This was a fun quilt to make, though my family sometimes wonders if I can stick to rectangular quilts…….